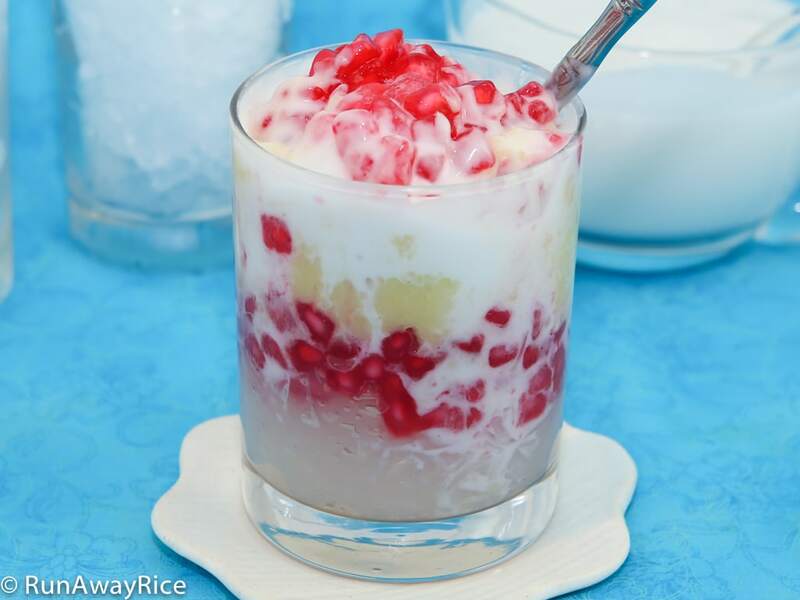 This popular chilled Vietnamese dessert with slivers of refreshing agar agar jelly, deliciously chewy mock pomegranate seeds, sweet mashed mung bean, creamy coconut milk and sweet syrup infused with Pandan aroma is full of amazing flavor and unique textures. Nothing is more refreshing than enjoying a big bowl or mug of this icy sweet treat on a hot summer day and this recipe will not disappoint. In this post, I share two different methods for making the mock pomegranate seeds. Both recipes are delicious and a lot of fun to make. Give them a try and let me know which one is your favorite! This recipe has a few different components and can seem daunting but it’s really not. 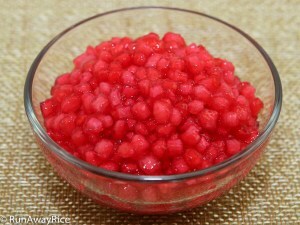 Most ingredients can be prepared in advance like the Agar Agar Jelly, Simple Syrup, Coconut Sauce and Mashed Mung Bean. These supporting ingredients can be made the day before and then refrigerated. For the mashed mung bean, as it has a tendency to harden when refrigerated, simply add about 3/4 cup boiling water and mix together to achieve the fluffy mashed potatoes consistency again. 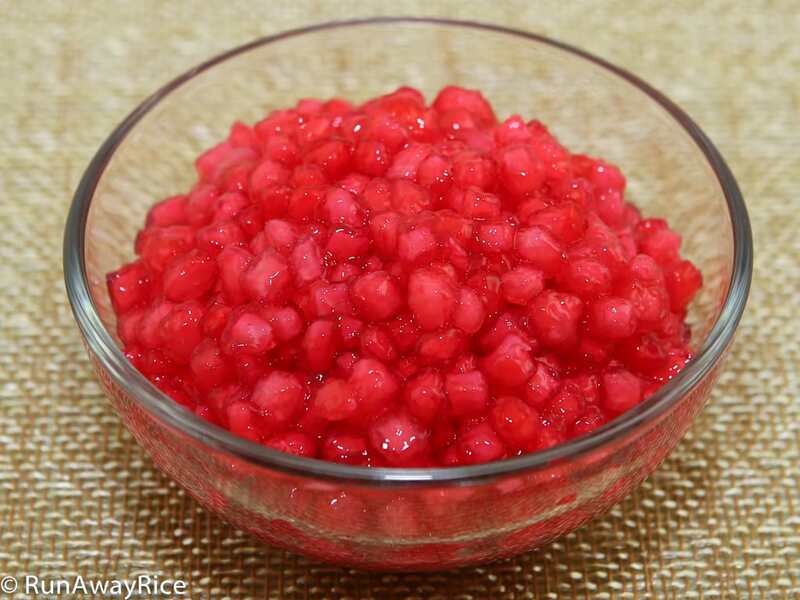 For the Mock Pomegranate Seeds made with water chestnuts recipe, if you really enjoy the chewiness of the tapioca starch, you can coat the water chestnuts 2-3 times with starch. The All Tapioca Starch recipe for making the Mock Pomegranate Seeds is super fun and reminds me of elementary school science class. The starch mixture starts out as a liquid but once the paper towels absorb most of the water, you’re left with a solid chunk of tapioca. If the tapioca mixture doesn’t set after 5 minutes, remove the wet paper towels from the top and replace with new, dry ones. The same can be done for the underside of the tapioca when you flip it over. If the tapioca is still wet, simply use more paper towels to absorb the excess water. If you let the Mock Pomegranate Seeds made with all tapioca starch dry completely, you can store in an air-tight plastic bag or container in your pantry and use at a later time. After cooking and if not serving the mock pomegranate seeds right away, add just a little bit of the simple syrup or cold water to prevent the seeds from sticking together. Be sure to serve within the day or they will become bloated and soggy. The pomegranate seeds are best enjoyed the day they are made but they can be refrigerated. To reheat, simply boil in water again for 5 minutes and then dunk in the ice bath to revive the chewy texture. To make the Mashed Mung Bean: Wash the beans several times with cold water until the water is mostly clear. Soak the beans in a large bowl of water for at least 4 hours or overnight. Close the lid and let the beans cooking using the residual heat for another 10 minutes. Transfer the mashed mung bean into a bowl. Cover and set aside for now. To make the Simply Syrup: Combine the sugar and water in a small saucepan. Cook over Medium heat, stirring until the sugar is dissolve. When the syrup starts to a boil, turn off the heat. Allow the syrup to cool and then transfer to a serving bowl. Set the syrup aside for now. To make the Agar Agar Jelly: Whisk together the agar agar powder and water. (The powder won’t dissolve completely.) Let the mixture rest for 15 minutes. Cook over Medium heat, stirring continuously to dissolve the powder. Add the sugar and combine. When the mixture comes to a boil, reduce the heat to Low and simmer for 2-3 minutes. During this time, skim the foam from the top and discard. Pour the hot jelly mixture into a glass dish or bowl. Allow to cool on the counter for 1 hour or until it sets. Run a knife around the container to loosen the jelly and then cut into thick bars. Use a mandoline with a blade for thick cuts to shred the jelly. Cover the jelly and chill in the refrigerator until serving time. 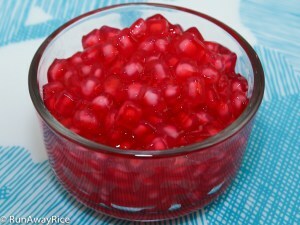 To make the Mock Pomegranates Using Water Chestnuts: Drain the canned water chestnuts and then rinse with cold water. Chop the water chestnuts into small pieces. Transfer half of the water chestnuts into a small bowl. Add 1/2 tsp red food color and combine well. Add 1/3 cup tapioca starch and combine with the water chestnuts coating all pieces evenly. Transfer the coated water chestnuts to a fine colander and then toss gently to remove the excess starch. Fill a large bowl with ice water and place a colander inside the bowl. Keep this close to the stove. Sprinkle a spoonful of the mock seeds into the boiling water and then stir to prevent sticking. Continue adding more spoonfuls of the mock seeds until all are added. 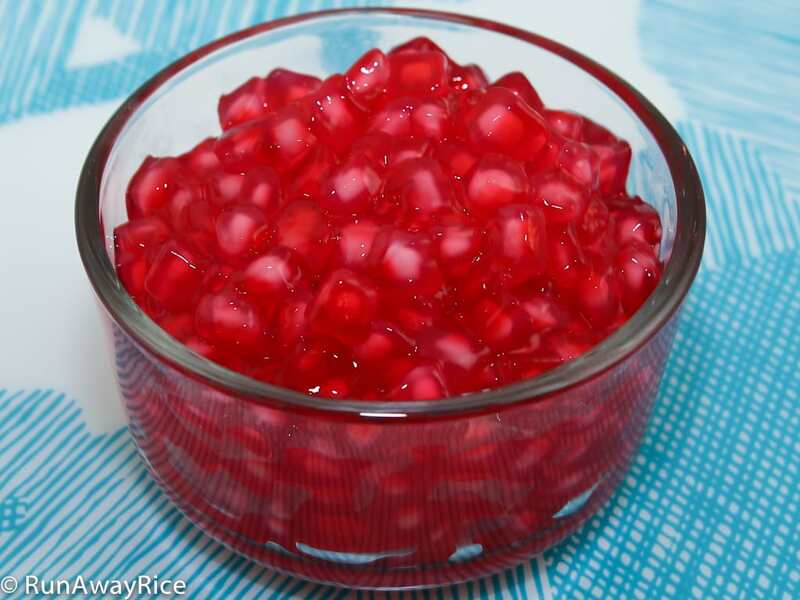 Reduce the heat to Low and cook until all the mock pomegranate seeds float to the top, approximately 2-3 minutes. Transfer all seeds to the ice bath and let soak for 1 minute. Transfer just the mock pomegranate seeds to bowl leaving the water behind. Continue making the next batch with the remaining water chestnuts. To make the Mock Pomegranates Using All Tapioca Starch: Line a 13 X 9-inch pan with 3-4 sheets of paper towels. Pour the starch mixture into the paper towel-covered pan. Place 3-4 more sheets of paper towels on top of the starch mixture, patting down gently. Let everything rest for 5 minutes. Remove the paper towels from the top and discard. The tapioca mixture should be solid now and moist. In a small bowl, combine the red food color and water. 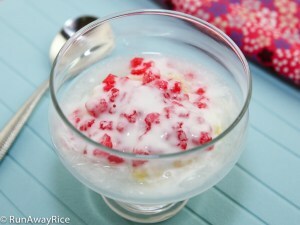 Use a brush to evenly coat the tapioca with the red food color. Place a cutting mat over the pan and then flip the pan over. Remove the pan and bottom layer of paper towels. Brush this side with red food color as well. Let the tapioca mixture rest until the surface is dry, approximately 10-15 minutes. Using a sharp knife, cut the tapioca vertically into thin strips, approximately 1/4-inch thick. Cut horizontally now to make small squares. Use a spatula to lift and separate the tapioca pieces. Then gently break the pieces apart along the cut lines. Sprinkle a spoonful of the mock seeds into the boiling water being careful not to dip the spoon into the water. Use chopsticks or another spoon to stir the seeds to prevent sticking. Continue adding more spoonfuls and stirring until all mock seeds are added. Cook over Medium Low heat boiling gently for 10 minutes and stirring frequently. To assemble this wonderful dessert, add a generous amount of crushed ice into a large mug or bowl. 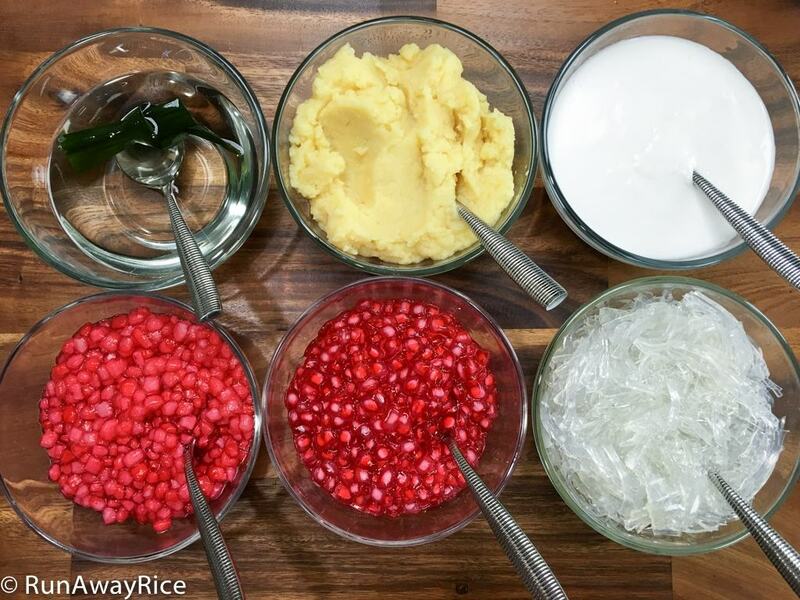 Add a few spoonfuls of the agar agar jelly, sweet mashed mung bean and mock pomegranate seeds. Drizzle with the creamy coconut sauce and simple syrup. Mix everything together. Now add a big straw to slurp up your icy drink or grab a big spoon and dig into your dessert soup. Enjoy! Please teach me how to make BOT CHIEN TRUNG, giong nhu truoc nam 1975. I’ll have to ask my Mom for this recipe! Just curious why you like the pre-1975 recipe?